The OASE OxyMax Air Pumps can be used to provide an ample supply of air within the fish tank to ensure a constant flow of oxygenated water. 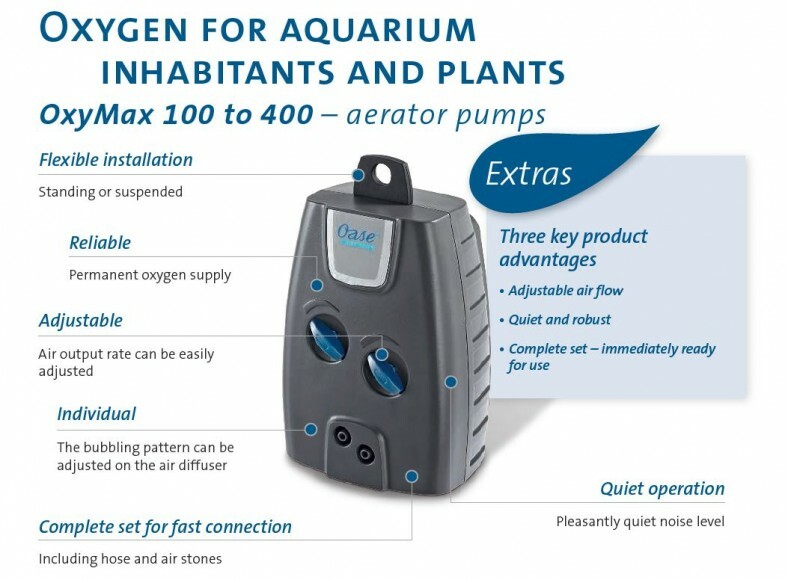 The OASE OxyMax Air Pumps can be used to provide an ample supply of air within the fish tank to ensure a constant flow of oxygenated water within the fresh water or marine environment. The OxyMax 100 features one adjustable air outlet for smaller tanks whereas the OxyMax 200 & 400 models feature two adjustable ports and the innovative air diffusers can be mounted to the aquarium glass or back wall. Oxygen is something that all living things need to survive and aquatic animals require dissolved oxygen inside the water they inhabit. Aquariums which are low on oxygen will show signs of this such as lethargic fish, anaerobic bacterial growth and high chemical waste levels. 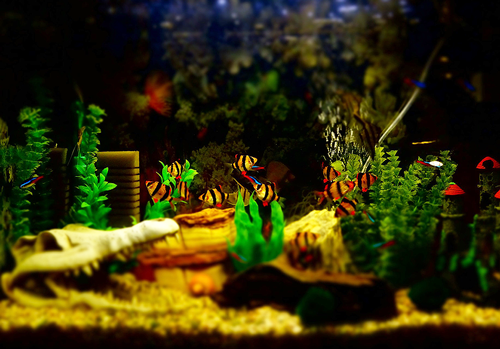 Adding supplementary oxygen will not only allow your aquatic animals a better quality of life but it will also boost the ‘good bacteria’ performance as these rely heavily on the presence of oxygen to convert the fish waste into nitrogen gas which leaves the aquarium. To ensure maximum efficiency hose lengths need to be kept to their minimum length and diffusers should be placed as deep in the tank as possible, allowing a longer time for the oxygen in each of the bubbles to be dissolved into the water as it rises. OASE OxyMax aerators offer a range of flow rates from 100 – 360 litres per hour. They feature a robust housing and multiple mounting methods to suit individual installations. Each outlet is regulated and can be adjusted to control the output flow rate. All aquarium aerator pumps will give some vibration and resonance due to the way they work however some are louder than others. The OxyMax aerators have been designed to offer a minimal amount of background noise possible. 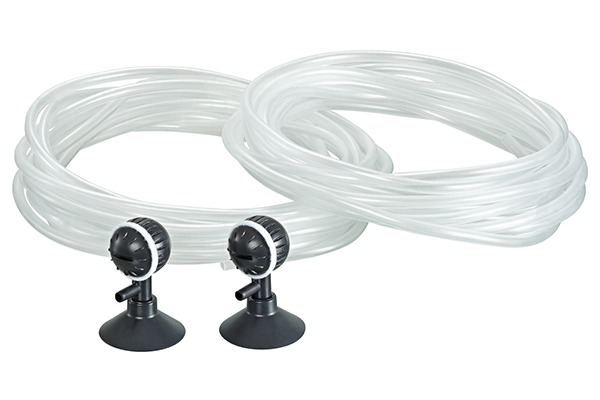 All OASE aquarium air pumps come with a 3-year guarantee and are provided with air hose and diffusers, making them a complete setup straight out of the box.